I spent my early years on the South Side of Chicago where I attended Coles School from the first to the eighth grade. I left the area for high school and lost touch with all my grammar school classmates. A few months ago, out of the blue, I received a call from Renee Chaden – one of my grammar school classmates. She was visiting her cousin Debbie in Miami and something possessed her to look me up. I was floored. I hadn’t heard from her or any of my grammar school classmates for 46 years! I had had such a crush on Renee. I remember thinking that she was to cool for me – which she was. I mean I was a dork and she was so cool. And to make matter worse – she was much taller than me. Renee returned to Miami this week to visit Debbie and today we got together for the first time in 46 years. I think it’s fair to say we have both aged a bit. I mean the last time we were together we were 13. We had a great time together today. We had lunch with my father which was really special because he remembered Renee from Sunday school car pool. Renee’s mother, who passed away before her time, kept many photographs and other memorabilia from Renee’s grammar school days. 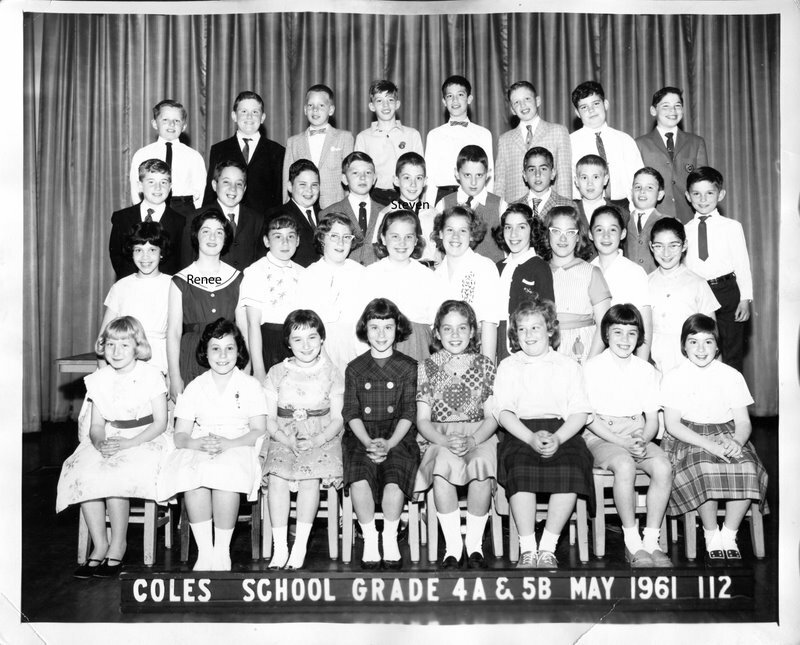 Renee brought our original Coles School class pictures with her. She has the class photo for every year that we attended – amazing. The pictures are everything I remembered – and worse. I really was a dork – big ears and in many I looked like a deer in the headlights. But Renee looked great. She looks like a character from the movie Hairspray with her poofed up black hair. Renee also had her graduation album with messages that many of us left. My message was so pathetic. I told her that I seriously liked her and that I was obviously too young to date her because she was only interested in older guys. It was a nice day together. It is a shame that I have lost touch with so many good friends from Coles.. This entry was posted in Friends and tagged Coles School Chicago, Renee Chaden, Steven D Pinkert, steven pinkert by Steven Pinkert. Bookmark the permalink.